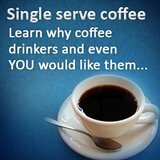 The beauty of having a combination coffee maker is it allows one to brew and enjoy coffee and espresso from one machine. 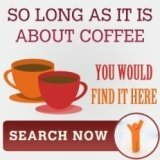 Therefore, if you can’t live without coffee and espresso, or if you live in a household with people who have different preferences, with some preferring coffee while others prefer espresso, then having a combination coffee machine would be ideal, since a single machine will satisfy all your coffee related needs. DeLonghi, one of the most popular and best coffee maker brands in the world, introduces the DeLonghi BCO130T Combination Coffee Maker. 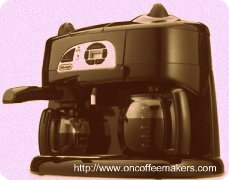 This combination coffee machine is the updated and improved version of the BCO120T and possesses features that you wouldn’t find in its predecessor. 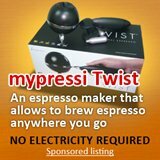 It combines a 10-cup filter coffee maker and a 4-cup espresso maker in one compact unit. Not only does it allow you to brew coffee and espresso from one single unit, but it also allows you to brew both at the same time. First of all, it is made of durable plastic with a glossy black finish. It measures 11 by 17 by 14 inches and weighs approximately 14 pounds. This effectively saves you a lot of precious countertop space, instead of having two separate bulky machines. The BCO130T features a fully programmable timer, which allows it to brew coffee and/or espresso at a designated time. In addition, it also features a convenient auto shutoff function, in which the unit automatically shuts off after it has been idle for two hours. It includes the Vario System and Accuflavor System, which allows you to set and adjust the brew strength of espresso and coffee, respectively. Furthermore, it boasts DeLonghi’s patented instant swivel jet frother system, which dispenses the right amount of froth right into your cup of espresso. In addition, it also has a Drip Interrupt feature, which allows you to pour a cup of coffee or espresso before the brewing cycle is finished. The DeLonghi BCO130T combination coffee maker also features a removable water tank, swing out filter basket, a warming plate, a decalcification system, water filtration system, and a permanent coffee filter. Truly, the DeLonghi BCO130T is one of the many combination coffee makers that are able to bring the best of both worlds, allowing you to enjoy great cups of coffee and espresso without the need for two separate machines. The BCO130T costs around $140, which ultimately costs less than having to buy a decent coffee maker and good espresso machine separately. However, despite all the positives, there is one glaring flaw with the DeLonghi BCO130T, which becomes apparent once it has been in use for quite some time (around 8 months to over a year). Apparently, it will develop leaking issues, particularly where the water flows from the water reservoir to the spray head of the coffee maker. 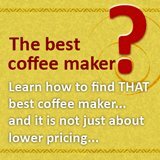 This is quite a shame, really, since this combination coffee maker does perform quite well initially and brews great coffee and espresso.